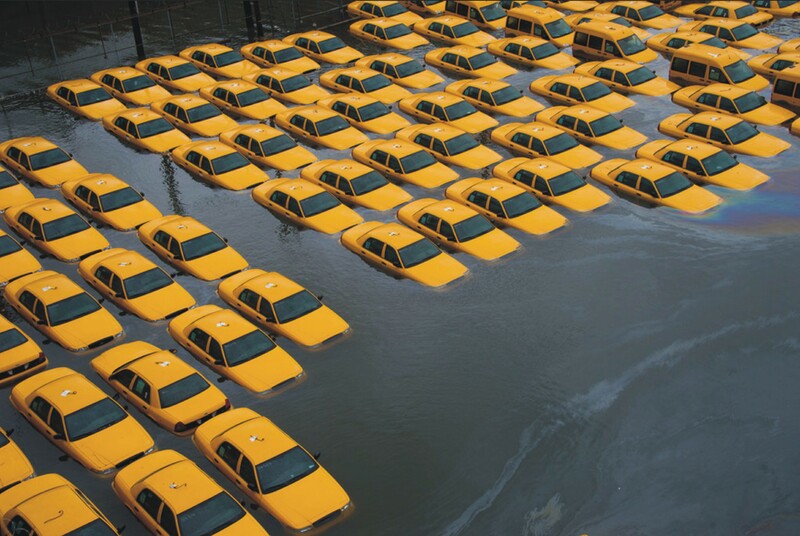 Now that Sandy has moved on, and some of us are lucky enough to have power and be getting back to “normal life”, I’m finally writing to recap what happened with the coastal flooding and how the forecasts compared to the observed flood. Coastal water levels in New York Harbor were the highest in all ~300 years of New York City (and New Amsterdam) history. The water level at The Battery was 13.9 ft above the average daily low tide level (MLLW) at 9:24 pm EDT, with a peak storm surge of ~9.2 ft coming close to high tide. This storm tide (water level) of 13.9 ft MLLW is about 5.5 ft above many of the area’s lowest sea walls. Water levels (WL) for the secondary gauge (primary one failed) at The Battery for Hurricane Sandy, relative to MLLW (average daily low tide), from NOAA/NOS. Obs-Pred is the “storm surge”. Sandy’s storm tide beat that of Irene by 4.5 ft, the (80 year) tide gauge record of Hurricane Donna (1960), and the estimated all-time record of about ~13.3 ft from the Hurricane of 1821. (though some estimate it to be more like 11.2 ft). The flood elevation at Kings Point (Western Long Island Sound) was ~14 ft a few hours later, with a peak storm surge of ~12.3 ft coming near LOW tide – fortunate! Our NYHOPS/SSWS webpage is offline due to the power loss in Hoboken, but the last graphical forecast of flood elevations that I have on my laptop (Monday at 10:30 am, posted on this blog) at Battery was low by 22%, and our forecast for Kings Point was low by 10%. Other forecast models also under-estimated the central forecast, likely in part due to the unusual nature of Sandy (aka “Frankenstorm”) and its surprising strengthening on the last day. The other models include P-Surge, ET-Surge (also shown here), and Stony Brook). Some other things we will examine as possible factors with our model’s underestimation of the final storm tide are summarized in a recent paper we published on Irene’s storm tide, and include the “sea surface drag coefficient” that helps represent how well momentum from wind is transferred to the ocean, and the high-bias of the NAM atmospheric model in forecasting a tropical cyclone’s low central pressure (thus causing our model to underestimate the inverse barometer effect). The forecast range given by NOAA’s National Hurricane Center was very valuable for decision-makers and the public, as they have a probability-oriented product that gives percent-likelihood exceedance levels. They used those results to predict a storm surge 6-11 ft, and the surge was 9.3 ft at The Battery and 12.0 ft at Kings Point. Stevens Institute doesn’t make probabilistic surge forecasts, but we’ve had preliminary signs that we’ve secured funding with a recent proposal to develop such a product. (click to see) Animation of GOES infrared satellite data showing cloud top temperatures for Sandy as she made landfall in New Jersey Oct 29, 2012 (Credit: University of Wisconsin). This entry was posted in water, weather and tagged Battery, elevation, evaluation, flood, forecast, Frankenstorm, hurricane, Kings Point, New York City, NYHOPS, P-Surge, Sandy, sea level, SSWS, Stony Brook, storm surge, storm tide, superstorm, tropical. Bookmark the permalink. Interesting stuff here! 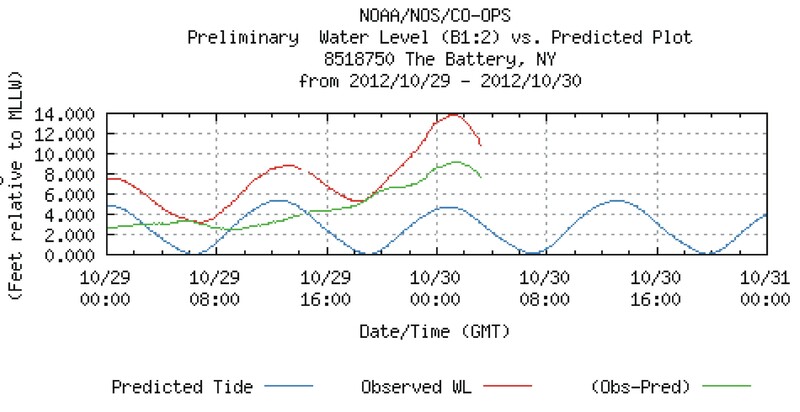 I am surprised to see the predicted tide plot in the Battery tidal gauge chart touch the MLLW line on each low tide. If the MLLW is the average daily low tide level, and this was a time of spring tides, with a greater-than-average range, I would have expected the predicted low tides to fall below the MLLW. If the MLLW moves up and down with the phase of the moon, it is not a good baseline for measuring sea wall heights. In response to my earlier post, it looks like it is just a coincidence. the 11/12 tide predicted value shows negative lows and highs approaching 6 feet.